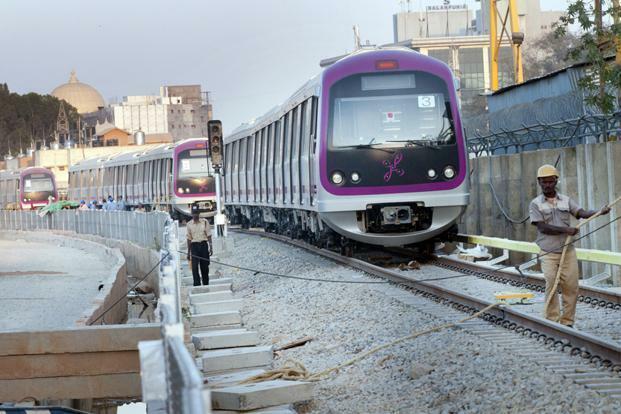 Bengaluru (Metro Rail News): The Bangalore Metro Rail Corporation Ltd’s (BMRCL) popularly known as Namma Metro is planning to run driverless trains along the Yellow Line (RV Road-Bommasandra), which is set to become operational by 2021. A senior official said the driverless trains will be introduced as part of the Communication Based Train Control (CBTC) signaling system, commonly called ‘driverless technology for the Yellow Line. “This is the first time that CBTC is being used in Namma Metro. The technology will help us run on automated mode while the operations are monitored through control centers,” he said. Namma Metro uses DTG (distance to go) signalling system currently, In which the time between two trains is two-and-half minutes. However, CBTC can reduce train headway to less than 90 seconds. As defined in the International Electrotechnical Commission CBTC systems allow different Grades Of Automation (GOA). CBTC-equipped Yellow line’s automation systems will meet GOA4 standards. Currently, BMRCL operates at GOA2, in which trains run automatically from one station to another, but drivers are responsible for opening and closing doors, obstacle detection on tracks and operating trains in case of disruption. At present, the Metro is running in over 40 cities worldwide using advanced GOA4, enabling trains to operate without drivers. “Unattended Train Operation (UTO), running on the GOA4 system, helps operate automatically without any staff on board. It enables trains to automatically run between stations, halts at designated platforms, adjusts speed, goes to depots and to turn round,” said a senior BMRCL official. Once the line switches to UTO, the train can accommodate more passengers as the driver’s cabin will be removed. According to them, the CBTC system also reduces human error and ensures passenger safety. For instance, trains will automatically maintain a distance between one another with the help of sensors on tracks.